Two villages were almost completely demolished. These are only two of many villages facing demolition and a strategy of forced displacement in the Jordan Valley. Fadia addresses the protesters and journalists to tell her story of displacement. Photo EAPPI/S. Spiller. Fadia is angry. 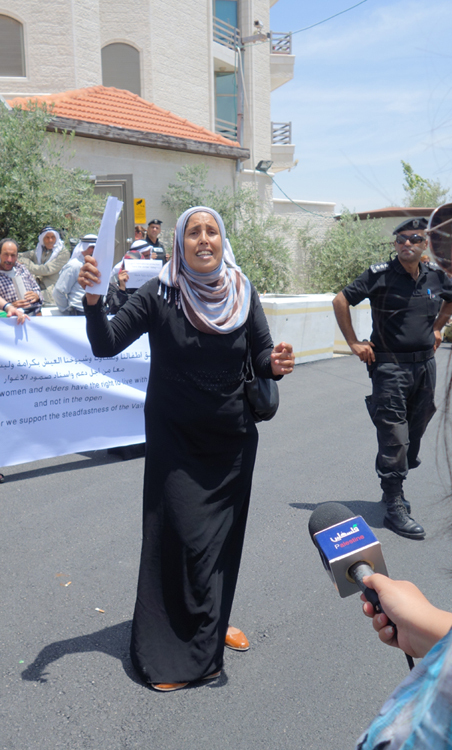 Today, she came from Fasayel to Ramallah with many other villagers from the Jordan Valley to protest in front of the UNOCHA building to say. The Jordan Valley needs international attention. The Jordan Valley needs international support. Since the failure of the peace negotiations and the decision of the Israeli High Court of Justice to include the Palestinians in the planning procedures in Area C, we have recorded an increased number of house demolitions all across the West Bank. We witnessed the ongoing harassment of two villages after they were almost completely demolished. 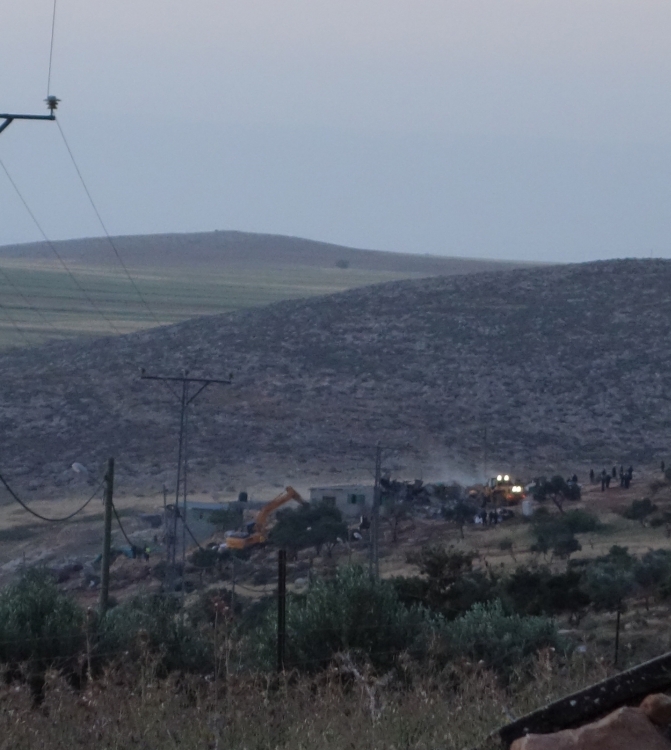 Bulldozers pull down dwellings in At-Tawayel. Photo EAPPI/S. Spiller. Sumud is the Arabic word meaning steadfastness or perseverance. The inhabitants of At-Tawayel / Tell Al-Khashaba embody Sumud. In this village, five dwellings, a mosque and four animal shelters were demolished on the 29 April 2014. 300 troops and four bulldozers were deployed in order to leave 27 people, including 19 children under 17, without shelter. The tents the Palestinian Red Crescent Society (PRCS) provided on the same day were confiscated less than 2 weeks later on the 12 May 2014, when Israeli forces destroyed the three new built houses. 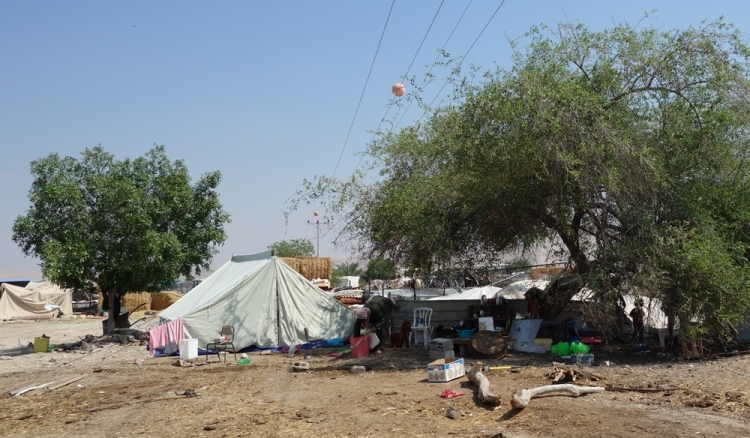 The PRCS provided new tents, but the Israeli Civil Administration sent some representatives on the 18 May in order to take the tents away again, as well as the concrete mixer the villagers used for the renovation of the old buildings. The people in At-Tawayel tell us that they have lived here for generations, and collapsed stone walls show a long history in this village. “We will die here in our right” emphasizing their determination not to abandon their land. No school today. Photo EAPPI/S. Spiller. Another essential aspect contributing to this Sumud is the solidarity At-Tawayel experiences from the inhabitants of the region. The people in Aqraba managed to raise about 320,000 Shekel to support the village and rebuild dwellings. Abu Al-Ajaj: will despair finally get the upper hand? On 21 May 2014, we received an emergency call came from Al-Jiftlik Abu Al-Ajaj, where Israeli authorities demolished 36 structures, leaving 52 people, of which 28 children, homeless as well as 4000 sheep and 15 calves without shelter. Another 12 people, including 3 children, where affected. The farmers explain to the team that they had come from Hebron to live here in the 1970s. “We are peaceful people”, they say, “we breed sheep, this is our income.” Facing the disaster, Usama, one of the displaced people exclaims: “This area is not demolished; it is an earthquake of the democratic state [of Israel]!”. Life has to go on. Laundry is hung even after a demolition. Photo EAPPI/S. Spiller. Lambs and goatkids are dying due to lack of water and staying under the burning sun. Photo EAPPI/I. Evje. Unlike in At-Twayel, the villagers in Abu Al-Ajaj still seem under shock when the team visits them some days later. They seem not to find the energy to stand up to the violence anymore. An old man continues to ask what to do: leave or stay? On call for UNOCHA, the EAs visit Abu Al-Ajaj on a daily basis for a week and witness great fear of further demolitions among the villagers. This fear also prevents them even to set up some improvised shelter. In May, the temperatures rise already much in the Jordan Valley, and neighbouring villages provide water tanks. Unfortunately, the water is not enough to cover also the animals’ needs; lambs and goatkids die under the burning sun and the eyes of helpless locals and internationals. The affected and threatened villages are all situated in Area C, which is under complete control of the Israeli authorities and covers about 60% of the West Bank. The demolitions are often justified because they affect so called “illegal constructions”, though, according to B’Tselem, the Israeli authorities rejected the vast majority of applications for building permits in Area C submitted by Palestinians: “From 2009 through 2012, a total of 1,640 applications were submitted. Only 37 – a mere 2.3% – were approved”; which means that the Palestinians living in Area C have almost no possibilities to build housing and animal shelters legally. An emergency tent shelter provided by PRCS. Even these are being destroyed and confiscated by Israeli authorities. Photo EAPPI/S. Spiller. Thus it becomes obvious that the recorded demolitions are part of a whole strategy aiming at the eviction of the Palestinian population from Area C.
At-Twayel and Abu Al-Ajaj are only 2 examples among many communities which have faced repeated demolitions in the Jordan Valley. But Palestinians do not surrender quite easily. The farmers and shepherds of the region have decided to join forces in order to organise their peaceful resistance. This is why Fadia and the others have come to Ramallah today. They want international attention. They want their story to be spread in the hope that this will help to prevent further displacements. They hope that international political pressure will help push the Israeli government to change its politics and to respect international law. There is no age limit that requires the respect of human rights. Photo EAPPI/S. Spiller. Children holding up the names of the demolished village in the Jordan valley. Photo EAPPI/S. Spiller. Fadia, Abu Sakr, Usama and the other villagers are obviously victims of abusive transfers. The “illegality” of the buildings can hardly been considered as a security threat and there is no identifiable imperative military reason for the demolitions. Further, not only the authorities fail to provide the inhabitants of the demolished buildings proper accommodation, but they even confiscate the emergency shelters provided by the Red Crescent. Fadia has quite enough reasons to be angry.